Researchers at the Moscow Institute of Physics and Technology (MIPT) report that genetically engineered fibers of the protein spidroin, which is the construction material for spider webs, has proven to be a perfect substrate for cultivating heart tissue cells. 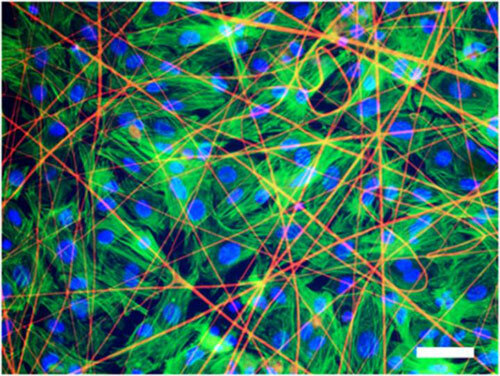 They discuss their findings in an article (“Functional Analysis of the Engineered Cardiac Tissue Grown on Recombinant Spidroin Fiber Meshes”) that appears in PLOS ONE. The cultivation of organs and tissues from a patient's cells is one of the keystones of regenerative medicine methods aimed at solving the problem of transplant rejection. However, a critical challenge is to find a suitable substrate on which to grow cells. The material should be nontoxic and elastic and should not be rejected by the body or impede cell growth. A group of scientists led by Prof. Konstantin Agladze, who heads the laboratory of the biophysics of excitable systems at MIPT, works on cardiac tissue engineering. The group has been cultivating fully functional cardiac tissues, able to contract and conduct excitation waves, from cardiomyocytes. Previously, the group used synthetic polymeric nanofibers but recently decided to assay another material, i.e., electrospunfibers of spidroin, the cobweb protein. Cobweb strands are incredibly light and durable, according to Prof. Agladze. They're five times stronger than steel, twice more elastic than nylon, and are capable of stretching a third of their length. The structure of spidroin molecules that make up cobweb drag lines is similar to that of the silk protein, fibroin, but is much more durable. Researchers would normally use artificial spidroin fiber matrices as a substrate to grow implants like bones, tendons and cartilages, as well as dressings. Prof. Agladze's team decided to find out whether a spidroin substrate derived from genetically modified yeast cells can serve to grow cardiac cells. For this purpose, they seeded isolated neonatal rat cardiomyocytes on fiber matrices. During the experiment, the researchers monitored the growth of the cells and tested their contractibility and the ability to conduct electric impulses, which are the main features of normal cardiac tissue. The monitoring, carried out with the help of a microscope and fluorescent markers, showed that within three to five days a layer of cells formed on the substrate that were able to contract synchronously and conduct electrical impulses just like the tissue of a living heart would.